In November, I read two books. My goal for December was to read four. I failed. Well... I take that back, I will say that I "failed" at reading four books, but I succeeded in celebrating the holidays in a big way, and I blame that for my lack of leisurely reading. I want to set a new goal. This year, I hope to read at least 30 books. Not necessarily new books, just 30 books in general. I think it's definitely feasable, considering that's less than 3 books per month. In December, I read two books that were vastly different from each other, but so good. 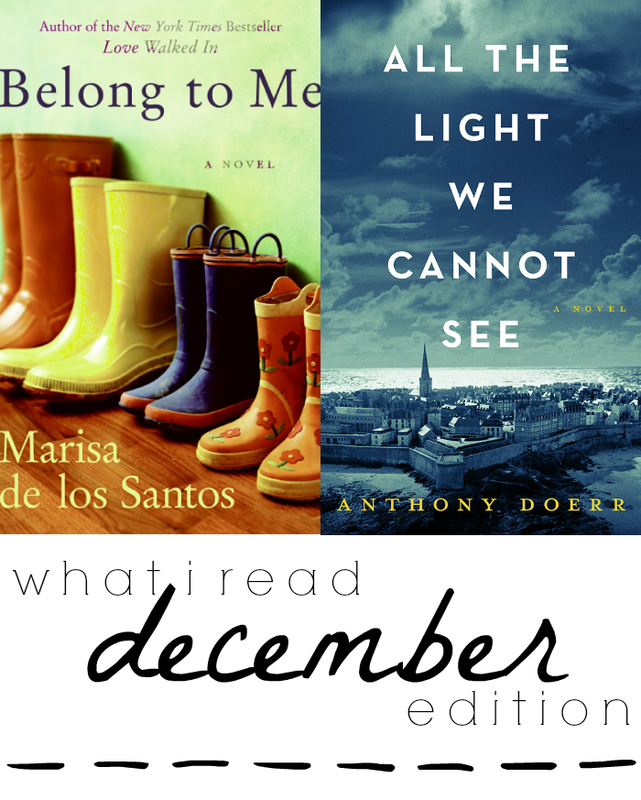 The first was Belong to Me by Maria de los Santos, and the second was All the Light We Cannot See by Anthony Doerr. I'm sure you've heard about both of them - and if not a synopsys then maybe at least the titles. They were both on NPR's "Best Books of 2014" list and they both deserved it. "But some things, no matter how unlikely, are just supposed to happen. You know what I mean. 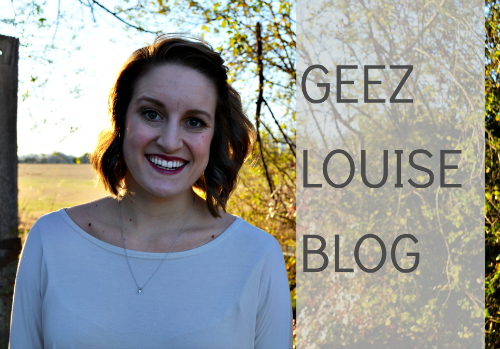 Somet hings just smack of the future and feel part of an overarching rightness." Belong to Me revolved around the lives of three suburbian women: Cornelia, who just moved from the city with her MD, gorgeous husband, Teo; Piper, who is far from experiencing marital bliss and who is watching her best friend battle cancer; and Lake, a single mother and waitress who also recently moved with her son, Dev. 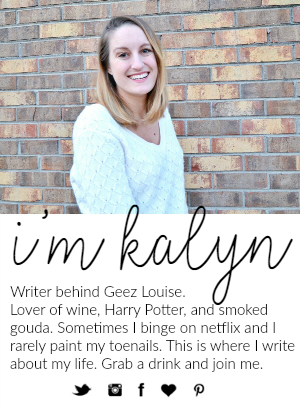 This definitely isn't your typical "fluffy chick lit" type of book that I thought it would be. De los Santos does an amazing job blending the stories of these three women as their lives become unexpectedly intertwined as past secrets are revealed. With the power of love, forgiveness, and strength of (unexpected) friendship, the three families are able to muddle through the mess their lives have become and form a bond with one another. Even though the story itself was almost "predictable," the writing and character development was amazing. I was able to connect with each of the women, cry all of their happy and sad tears right along with them, and feel their anger, frustration, and grief as though it were mine too. "His voice is low and soft, a piece of silk you might keep in a drawer and pull out only on rare occasions, just to feel it between your fingers." All the Light We Cannot See is a book set at the closing of WWII, and covers the lives of a 16 year old blind French girl, Marie-Laure, and an 18 year old German soldier in the city of Saint Malo on the southern coast of France. While the plot itself isn't that "exciting," Doerr's writing will keep you hooked. Though the book begins, and ends, in the final weeks of the war in 1944, many of the chapters are set from 1940-1944 and give all of the backstory and events leading up to the end of the book. Yes, this is a "war story," but it is also a coming-of-age story, a story of morals and values, and a story about the choices we make and how the reverberate through our entire lives. It is a story of choosing right over wrong, of going against the odds, of loss, heartache, and love. I've always loved historical fiction (which I will admit is why I originally wanted to read this book), but Doerr makes it so much more. Did you read any good books last month? What are your reading goals for the upcoming year? If you like historical fiction, highly suggest The Girl You Left Behind by Jojo Moyes if you haven't read it already. It starts off with the historical part then the second half is current, but the historical part ties into the current part. It started off a little slow for me, but once it picked up I couldn't put it down. Awesome! Looking for cyber book club suggestions, if you think of anything you've read lately that would make for great discussion! I read "The Secret Keeper" and "The forgotten Garden" by Kate Morton. I love her style. All her books have similar themes of multi-generational families, and how past secrets affect generations later with great mystery themes. They're fairly easy, but fun reads. All the Light We Cannot See is definitely on my list for this year! In fact, I just posted about it today. :) I already put it on hold at two different libraries, so hopefully I won't have to wait too long haha. It's popular! Always looking for great books. What's your favorite?